Sucina Golf & Country Club is a new development of elegent townhouses and villas built to the highest specifications. Sucina is located in the Murcia region of Spain with its 250km of beautiful coastline, 320 days of sunshine a year, unspoilt nature reserves, traditional villages and historic cities. 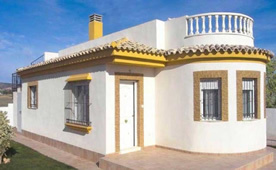 It is only 12 km from the sandy, Blue Flag beaches of the Mar Menor and walking distance into the charming country town of Sucina with shops, restaurants, bars and street markets. The development is on the edge of national parkland and the area is ideal for horse-riding, trekking and cycling. With Murcia-San Javier International Airport only 10 minutes away and Alicante Airport 45 minutes access from anywhere in Europe could not be easier. Sucina Golf & Country Club comprises of 2 & 3 Bedroom detached Villas and 2 Bedroom Semi detached Bungalows. 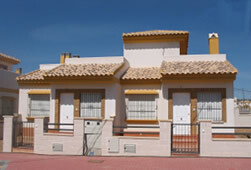 This luxury, 3 bed, 2 bath, detached property is a "Carthago" model Villa. It is air-conditioned through out and is being sold fully furnished to a high standard including all white goods and electrical appliances. It has only been used for a few weeks since its completion and is ready to move straight into. The living, dining and kitchen areas are all on the ground floor along with two twin bedrooms and a good-sized bathroom. The impressive master suite is on the 1st floor. The garden has been gravelled and the driveway paved for off-road parking. On the ground floor there are paved terraces to both the front and rear of the villa and on the 1st floor there are 2 further good sized terraces including one accessed from the en suite master bedroom. The largest of these terraces gets day-long sunshine and has views across the town to the hills. Garden furniture includes table and chairs, loungers, a BBQ and a large, self-assembly pool (there is an outside tap).